Admiral Yachts and selling broker Lucid Yacht Group have delivered the 38 metre superyacht Tremenda to her new owners who will spend their first season in the Mediterranean. 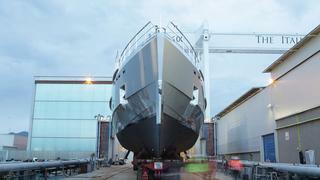 With an aluminium hull and superstructure, Tremenda can reach a top speed of over 20 knots. A shallow draft allows her to cruise in low depths, making her ideal for Caribbean cruises, a specific request from the owner when the project was started. Exterior styling by Luca Dini gives her a modern-looking military appearance that follows the styling of the rest of the Impero range. The interior design by Gian Marco Campanino and Admiral Centro Stile features dark joinery throughout, which contrasts with the rare marble panels and natural leather surfaces. Tremenda's beach club allows access to the full beam garage, featuring a side opening hullport for retrieving and launching the main tender. Going forward there is access to the engine room through the engine control room, an uncommon feature on a yacht of this size. The raised bridge can be reached via the pantry on the main deck, while an internal staircase links this area to the upper helm station. The main saloon is surrounded by glass and flooded with natural light, creating the feeling of a continuous space flowing into the aft cockpit. The interior layout features a full beam main deck master suite, with a full beam ensuite. On the lower deck the four guest cabins, two VIPs and two doubles, each have their own ensuite as well. Tremenda will be used by the owner and his family on a private basis, starting in the Mediterranean and then in the Caribbean and US waters. 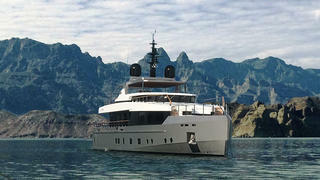 Sold by Lucid Yacht Group, Tremenda is the American broker's second new-build project with the Italian Sea Group. The 38 metre superyacht is part of the Impero series and follows Admiral’s launches of Quinta Essentia and Ouranos earlier this year. 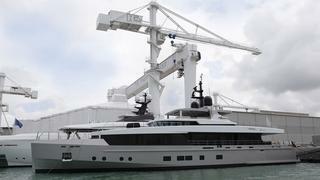 Tremenda is the third superyacht of the series after Cacos V was delivered in 2013 and NONO was launched in 2014.